Knitting Pattern by B. Hooked Knitting, Copyright 2018. Your finished knit cowl will measure approximately 6.5″ wide and 40″ long before seaming the ends together. This perfect knit cowl uses a simple four row repeat, an economical yarn and color techniques to create a design that looks much more complex than it actually is! You can get really creative with color – the stitch pattern has enough texture for one color, however, it’s simple enough to accommodate multiple colors without competing with it! Feel free to leave comments below with any questions! With color A, CO 22 sts. Row 2: K first st. k2tog to last st. K last st.
Row 3: K first st. KFB to last st. K last st.
Rep last four rows until your cowl measures approximately 20″ from cast on edge ending on a purl row. Join color B and continue with stitch pattern repeat (rows 1-4) until your cowl measures approximately 40″ from cast on edge ending on a purl row. Bind off on a knit row. Before you seam the two ends together, I recommend you block your cowl to even out the stitches and edges. If wet blocking is a new technique for you, I have a tutorial to walk you through it! 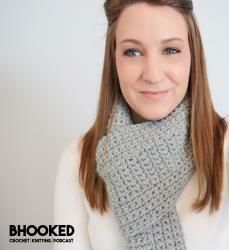 Tie a loose knot in the cowl that rests near the color change. Using a darning needle (and your favorite seaming technique), sew the two ends together.